Residents of Dwarka had an unexpected visitor on Gandhi Jayanti: Mohan Bhagwat, the chief of the Rashtriya Swayamsevak Sangh (RSS). It was the first time an RSS chief had chosen to make the traditional address—annually convened in the Capital for shastra puja (weapon worship)—in Dwarka, one of the fastest growing suburbs located in the Capital’s south-west. 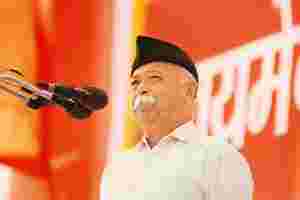 The presence of Bhagwat was expected to give a boost to the cadres that the RSS has been seeking to expand in the suburb that’s emerging as home to white collar migrants. His Friday address was attended by an estimated 15,000 RSS cadres clad in their traditional khaki short pants, white shirts and black caps. In the decade that the suburb has come into being, the 84-year-old Hindu nationalist organization has set up 200 shakhas (daily assemblies) in Dwarka. The suburb also represents the new and more flexible face of the RSS. Keeping in mind the fact that potential cadres will come from professional ranks, the RSS has ensured timings and the regimen are flexible. While conventionally, the shakhas have operated in the morning and entailed exercise drills—as part of the efforts to create a disciplined cadre—the RSS has now included night shakhas in areas such as Dwarka to accommodate working professionals. Exhorting the assembled cadres in Dwarka to make the nation Sanghmayi (drenched in RSS following), Bhagwat said: “While our nation has the reputation, it has utterly failed to secure supremacy in the world arena. Our values of truth and non-violence cannot be asserted until we wield and worship power, something which the RSS preaches and practices." The RSS, which is the ideological parent of India’s main Opposition Bharatiya Janata Party (BJP), has become critical once again, especially after the two successive general election defeats. Analysts believe the rebuilding efforts are designed to reposition the RSS as an acceptable ideological faith to a rapidly evolving demography, moving away from the traditional perception of being dominated by the upper castes. Critics are not too impressed. According to them, the fundamentalist, religious and ideological slant militates against its ability to reach out to a wider cross-section in the country. “They can act as a major positive force, but the organization should first make their stand ample clear that are they in favour of an inclusive society with respect for all castes and religions," said B.G. Varghese, political analyst and visiting professor at the Centre for Policy Research. 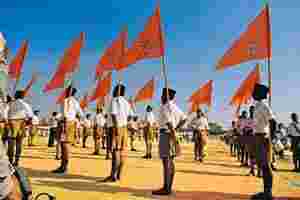 The RSS has expanded its presence steadily since 1990, growing its base of shakhas from 29,000 in 1990 to 40,000 at the end of March. Most of these expansions have come about in Andhra Pradesh, Tamil Nadu and Kerala, which have a strong presence of the socially backward communities. The right-wing Hindu organization was formed on Dussehra day in 1925 by Keshav Baliram Hedgewar in Nagpur, its headquarters. The organization, which was originally formed to unite Hindus—who form the majority of India’s population—today has at least 800,000 cadres attending its daily shakhas across the country. According to former RSS functionary and BJP leader K.N. Govindacharya, the image of the RSS so far has been that of a paramilitary and secret organization, quite contrary to reality. “The RSS itself is to be blamed for it. There is an effort from the RSS part to change the image," he said. RSS leaders admit that the organization is trying to re-invent itself in order to attract more youth and the weaker sections of society, although it officially disagrees that its popularity has gone down. The new initiatives includes non-traditional methods to reach out to people. It runs “IT Milan" (information technology meetings)—an informal gathering of its supporters and sympathizers from the IT sector—in cosmopolitan cities such as Bangalore, Hyderabad, Chennai and Mumbai. The organization, known for its emphasis on discipline, has become more flexible with its timings and is advising members to join the night shakhas. It has also set up a group of senior functionaries to reach out to political leaders and bureaucrats, known as the Vishesh Sampark Yojana. The organization, which runs over 40,000 shakhas across the country, also uses social networking to attract youngsters. “Using online social networking resources like Yahoo Groups and Orkut, and weekly physical meetings called IT Milans, the Rashtriya Swayamsevak Sangh has over the past six years built a steady stream of new age ‘software shakhas’ to groom busy IT professionals in the RSS way of thinking," said Ram Madhav, RSS spokesperson. Adds Suresh Naik, a doctorate holder in microelectronics and full-time RSS worker: “The new-age shakhas (on Web platforms) concentrate less on the physical aspects, but more on stimulating the minds of its members to nationalistic thinking and a life of service," said the coordinator for the IT branches.